I have been chasing a really nasty bug and I think I have narrowed it down to memcpy. Is there some delay or asynchronous nature to memcpy that I should be aware of, perhaps specific to this architecture or compiler? My actual problem is that my freeRTOS streamBuffer seems to be not working, and different writes to it stomp on each other (example 2 below). example 1: I use memcopy to clear my TX buffer before each iteration. This was to troubleshoot a different issue but I noticed that if I was debugging then everything was fine. BUT if i ran the system normally I would get nothing but zeros. Example 2: My real problem. I am using FreeRTOS and writing to a StreamBuffer twice from within the same task. It is an IMU so basically one write for a packet of acceleration data and one write for a packet of magnetic data. Somehow the packets are stomping on each other. I dug down into the FreeRTOS code and it looks like they use memcpy under the covers... I feel silly blaming my issues on a library function but I don't see anything else? // TODO: make buffer slightly larger and have the log write calculate size from err and header size. Did you mean to use memset rather than memcpy? Otherwise you're copying data from address 0, which is probably not what you want. nice catch, But i was actually using memset() in my tests. It is no longer in my code though, so i typed the (wrong) line back in by hand here when I copied my code over. I fixed it but left a note. So i guess my strange behavior is with memset and memcpy, with memcpy being used inside the freeRTOS functions to copy to the queue. Not knowing the declaration of DATA_TRANSMISSION_t and IMU_MSG_t it's impossible to know what is going on. But commonly such problems come from incorrect allocation. The magic numbers 25 and 25*6 look worrying, are there allocations matching this (then why not use sizeof or a #define)? The magic numbers are only in my debug code. The actual acceleration and magnetic data was hard to tell apart so I added the memset right before transmission to make sure the data is identifiable, without interfering with the collection. Here is the definitions of the two structs, and you can see where the 25 and 6 come from (25 samples per packet, each sample is 3 16-bit integers). 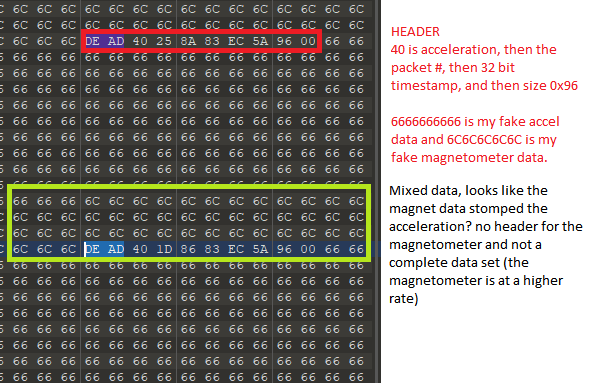 The magnet data comes in much faster than the Acceleration (the accelerometer has a FIFO the magnetometer does not), so a data ready interrupt from the magnetometer could happen during the accelerometer code, but all the ISR does is send a notification to the task, and then the magnetometer block should run. Still open to any ideas on this, but I changed the architecture of my design. and then I just have to use the code from my first code snippet to copy from each packet into the flash buffer and split across buffers as needed. Seems to fix the data stomping problem so I guess that is great. But it is much less RAM efficient (which I am pretty tight on) since I need two arrays on the read side instead of one now, and the extra space in the queue to store each packets size. If I find out anything more I will post it here. Though I will probably look at our flash library to save some RAM since despite the overhead the message buffer is pretty cool and makes other parts of the design simpler.